DC Comics and Sideshow Collectibles are cooking up something special for Catwoman enthusiasts! This 22-inch statue from the Premium Format collection features the gorgeous Catwoman in stunning detail, based on the likeness of Ms. Selina Kyle herself. Since her 1940 debut, she’s Gotham City’s most infamous feline persona. 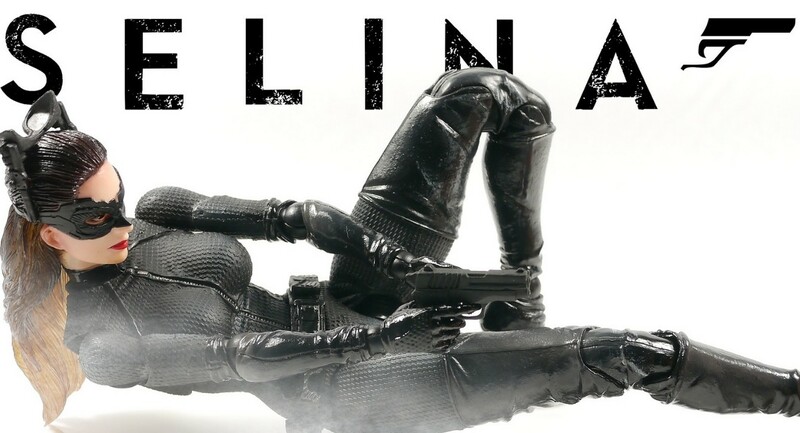 Re-creating the aesthetic of Jim Balent’s 1990s design from Catwoman’s first solo comic, this deluxe statue is perfect for the cat burglar’s true aficionados and aficionadas. A violet suit and high black boots adorn this more agile and battle-ready Selina Kyle. Wielding her whip while her hair whips in the wind, this is one statue that you will want to get your paws on. Preorder her for delivery in January of 2016. Sideshow has garnered a whopping amount of acclaim with its Premium Format line of statues, showcasing much-loved characters from the comic-book world in incredible, detailed 1/4-scale. Hand-painted and hand-sculpted, they demonstrate some of the most intricate statue-making techniques of today. Needless to say, if you get your hands on one of them, you’re seriously #blessed. Which leads us to don our best Vanna White gown and present to you this absolutely gorgeous Selina Kyle Classic Catwoman statue! Ms. Kyle debuted in her first solo comic in that beautiful decade that was the 1990s, and we’re so glad she did. Her look as envisioned by Jim Balent represents her transition to a more agile and battle-dynamic cat burglar, and her figure-hugging purple getup and whip lend her a helping hand. Preorder the 22-inch Catwoman now for arrival in January of next year! Purple is the new black, really. New for DC’s “Premium Format” statue series is this absolutely gorgeous Catwoman statue. Pictured with a black cat and her trademark whip elegantly spiraling around her body, Gotham City’s most infamous cat burglar stuns. Selina Kyle’s night-vision goggles and skintight, black suit accent her svelte silhouette. Looking back at you with a cheeky grin, Catwoman is ready to stand out amongst your carefully curated collection. What’s on her mind — the next heist or a kiss from a certain caped crusader? She’ll never tell. This beauty ships out come November, so reserve your statue now! The Batcycle was given a sleek, nomenclatural makeover and deemed the Batpod for installments in the Dark Knight series in the latter half of the 2000s. Not only is it Batman’s primary mode of vehicular transportation, but it is notably used by Selina Kyle in The Dark Knight Rises to duel against Bane for the safety and well-being of Gotham City. In June, you can grab a recreation of the legendary cycle for your very own collection. Pre-order the sleek, glossy mini-machine from Medicom so it comes in time for next summer. Execute a smooth getaway from cronies. 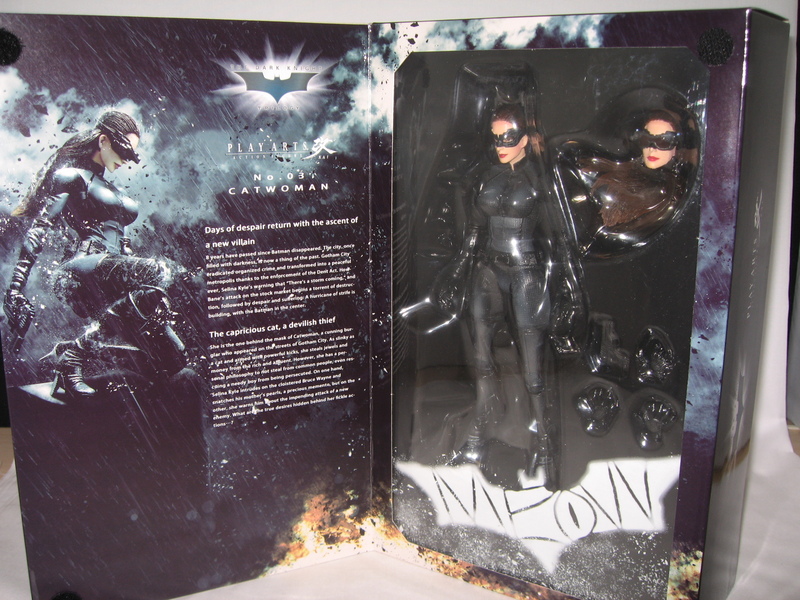 Whipped out the camera and took some additionl photos of this version of Selina Kyle figure based on the Batman Movie. From Square Enix. 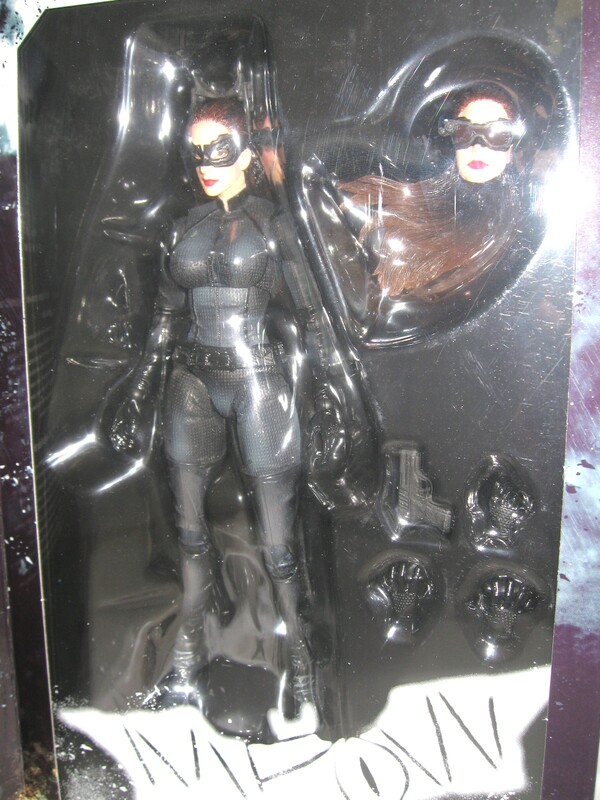 An iconic character from the Batman movie trilogy directed by Christopher Nolan makes her appearance in the Play Arts KAI action figure line: from The Dark Knight Rises, the beautiful burglar Selina Kyle, with alternate sets of hands, handgun, exchangeable hair piece, alternate head, and display stand.